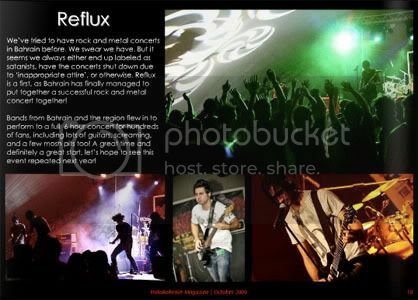 - Reflux: Yes Bahrain, we finally did it! Our first rock and heavy metal concert that didn't get stopped over accusations of Satanism or T-Shirts that worship the devil! Hurray! 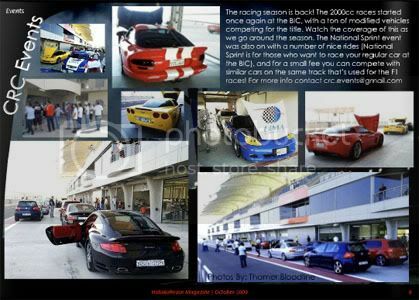 - Check out the CRC and other races at the Bahrain International Circuit, for a good dosage of adrenaline pumping thrills! - Thee Project: An exclusive interview with Bahrain's very own nutcase rock and alternative band! With everything from heavy metal covers of traditional Persian songs, to tracks about not finding a parking spot in Diplomatic Area during the morning, they're definately a laugh! - Also in this issue: Looking for a traditional Bahraini breakfast? We check out Gahwat Haji for a dose of balalee6 and chai 7aleeb! We also cover Eid in Adliya, the Full Moon parties at AlDar Islands, Bahrain vs New Zealand qualifying match, and more!